Hi D Ho! 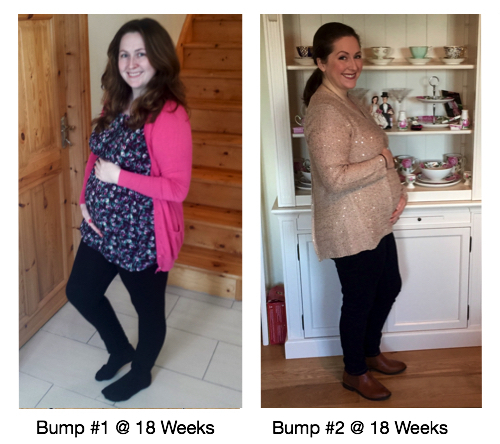 Week 20 pregnancy update is here already, baby is now the size of a banana and we have reached a really big milestone – 20 weeks marks the half way point for the pregnancy or half way to guess date! I say guess date instead of due date as growing a baby in your tummy is not an exact science of exactly 40 weeks, instead its a bit more like baking a cake (or bun – pardon the pun) in an oven – you need to keep an eye on your cake and be prepared to give it an extra few minutes in the oven if needed. Full term pregnancy is really anywhere between 38 and 42 weeks – babies rarely arrive bang on 40 weeks. Hi D Ho! Week 19 pregnancy update is here already and baby is now the size of mango (or an heirloom tomatoe if you’ve been paying attention to too many US based baby websites like us 🙂 ). Babies kicking up a storm these days and certainly making their presence known. Hi D Ho! This weeks sees me at week 18 and for this weeks pregnancy update baby is now the size of pepper – five and a half inches long! Bump however seems a lot bigger than a pepper 🙂 – what you do you think? This week I got some more measurements done at bootcamp with Ronan Bilbow Fitness and I’m super excited to say that in the last four months since Ive been pregnant I have managed to lose 5 cm from each of my arms and 8 cm from each of my legs. Great to see that my first five million squats are starting to pay off, after all they are the go to exercise when tummy exercises need to be cut out. So heres to the next five million squats – by the end of this pregnancy I better have some serious buns of steel! Hi D Ho! 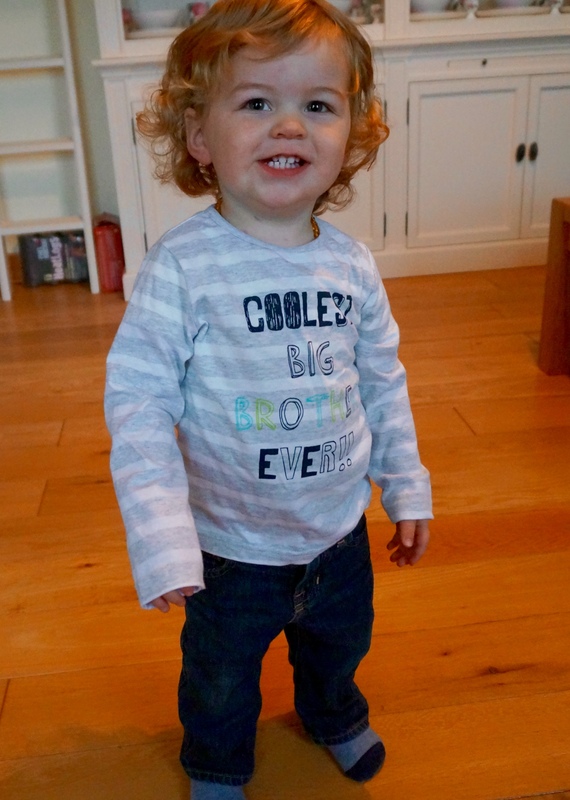 Finally we get to share the great news, our little man is all set to become a big brother! Little Man is so excited to become a big brother! The newest member of our little family is due arrive in early April 2016 making me 17 weeks pregnant. 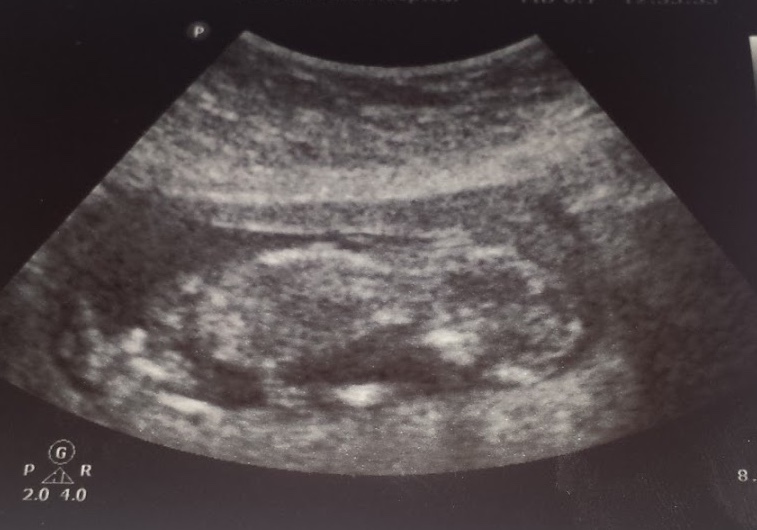 Recently we had our first hospital appointment and scan, so now we feel happy to finally tell the world (quite literally it appears seeing as I’m posting our story on the internet). Anyway I decided to start this little blog to track our baby journey second time round following on from our lessons learnt with baby #1. So far the last 4 months have been exhausting, if I had my way i’d sleep all day long every day but unfortunately a full time job and a wonderful little son to cuddle when I get home keeps me busy. Morning sickness – should be renamed all day sickness – has been pretty tough, lots of constant queasiness and reactions to everyday smells. Walking around the canteen at work has literally become a nightmare where my nose is assaulted at every different counter. Who knew that porridge could smell so bad! Food wise Im also gone all funny about what I can face eating. Im starving in the mornings but can’t stomach my normal boiled egg any more so I’m back to my little vice of jambons – Im counting these as my use of extra daily calories required and trying to be good for the rest of the day. Otherwise Im being pretty healthyish food wise, trying to stick with soup and sandwiches for lunch or plan old cornflakes when I just can’t face anything else and some fruit and yogurt (also sometimes known as cake) for tea at 3. Im very lucky to have dinner ready for me when I get home from work so that helps to keep me on the straight and narrow in the evening food wise. One of my big aims with this pregnancy is to watch my weight gain, I put on a bit too much with baby #1 and really had to fight every pound off one by one afterwards. I want to ensure that I don’t have as big a battle to face after baby #2 so I have been keeping up my original exercise as much as possible. I had been going to early morning bootcamp classes at Ronan Bilbow Fitness 3 times a week so once I got the all clear from my GP I kept going. I did however have to move them to evening classes – burpies at 7am are not your friend when suffering from morning sickness! Ronan and his team have been great at modifing the regular classes with little tweaks here and there to ensure they are still safe and doable with my growing bump. Im hoping to keep up the bootcamp classes for as long as possible and maybe take up some pregnancy pilates and swimming later on. Thankfully so far I have only gained 2 Lbs which is great for 17 weeks. Looking back at my old notes I had gained 7Lbs by week 14 last time round so definitely getting off to a better start this time round. 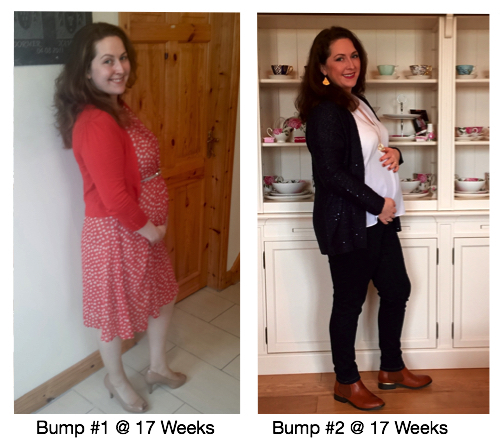 I have however “popped” already and am sporting a nice little bump – have a look at photos with baby #1 at 17 weeks and now baby #2 at 17 weeks above. The biggest change we have made this time to prepare for our little arrival is hiring a doula. A doula’s purpose is to help women have a safe, memorable, and empowering birthing experience.When a doula was present, women are less likely to have pain relief medications administered, less likely to have a cesarean birth, and reported having a more positive childbirth experience. So heres hoping for an easier birth this time round (Dear Son #1 was far to comfy where he was and didn’t come out with out a fight). Anyway thats my little update on the last 4 months, I hope you join me as I track the next 5 months documenting all the little lessons we learn along the way. 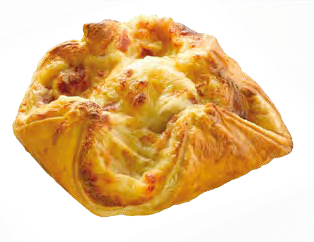 Chat you soon!